Escape to a mountaintop in Blue Ridge to a home with some of North Georgia's best views that extend out to two more states. 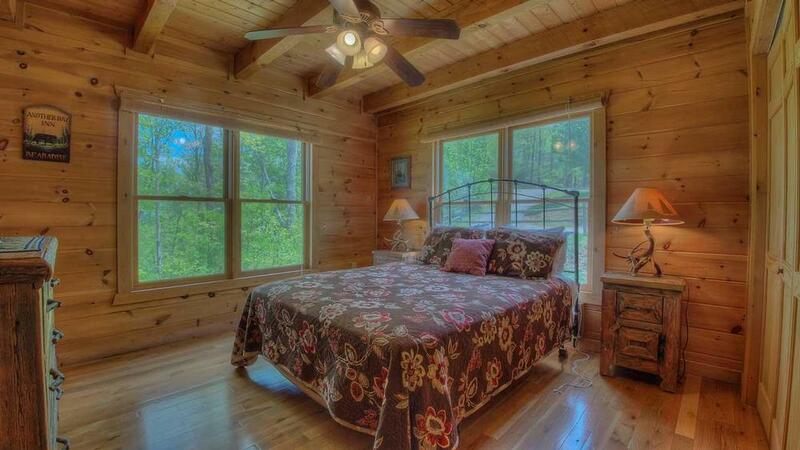 Summit Escape is in the wonderful community of Sun Rock Mountain, and is easily accessible off of paved roads. 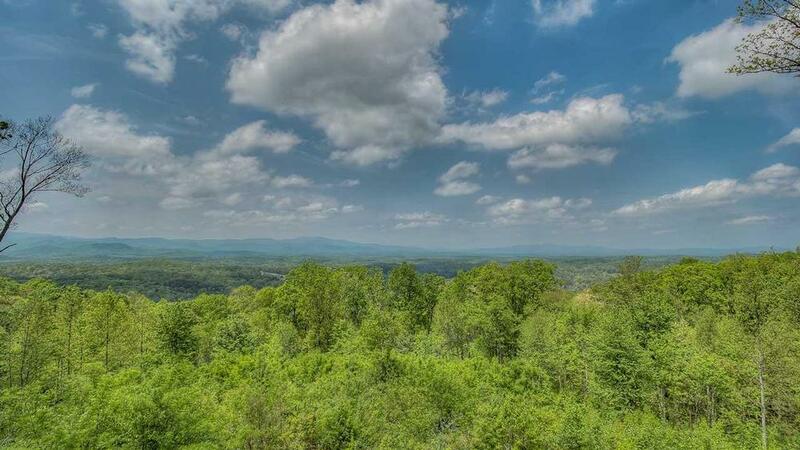 This property is adjacent to 100 acres of pristine, undisturbed wilderness, yet is convenient to downtown Blue Ridge and McCaysville. 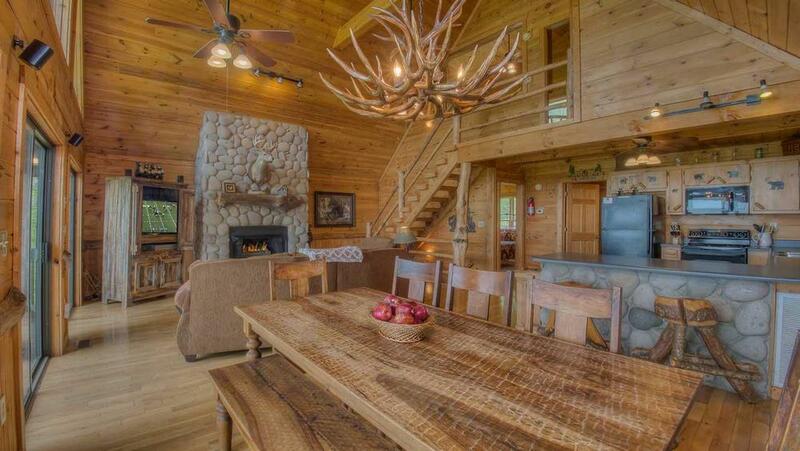 There is no better place than this cabin's expansive wraparound deck or beautiful screened in porch to watch the area's abounding wildlife from wild turkeys, to deer and hummingbirds. There are new owners as of 2019, and with the new owners, there are numerous updates! All new kitchen stainless steel appliances, new granite countertops and refinished hardwood floors. The main and downstairs bedrooms have new premium queen pillow top mattresses/boxsprings and there's new bedding on all levels. Even the basement has a brand new look, with an all new ceiling! 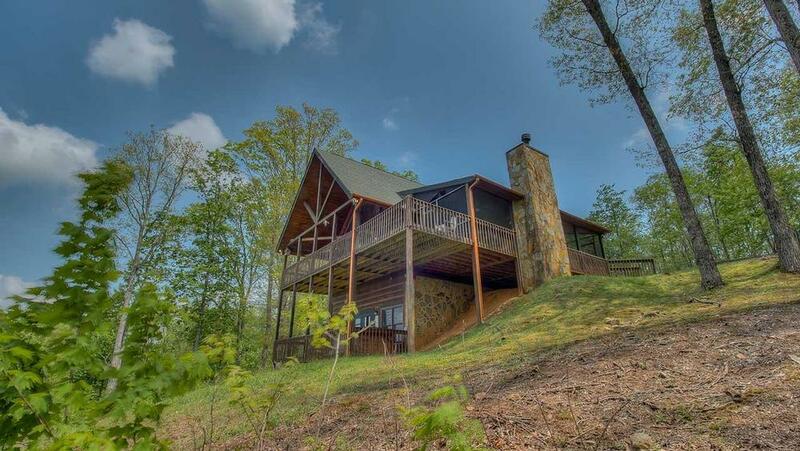 This home has a great prow-front and a huge wrap-around deck hugging the main floor. Enter inside where the light pine-wood interior brightens further thanks to the floor-to-ceiling windows in the great room. A spacious kitchen overlooks the view as well as a play area just outside for the kids to explore. The home's open floor plan offers great spots to gather for either a quick breakfast at the breakfast bar or a leisurely meal at the large dining table from where you can also gaze to the natural beauty of the mountains. Time will melt away as you gather and chatter with friends around the benches placed fireside in the screened porch area or during a soak in the lower-level hot tub. Continue the conversation and fun in the downstairs game room by the cozy stone-faced fireplace or grab a game or two of air hockey and pool. 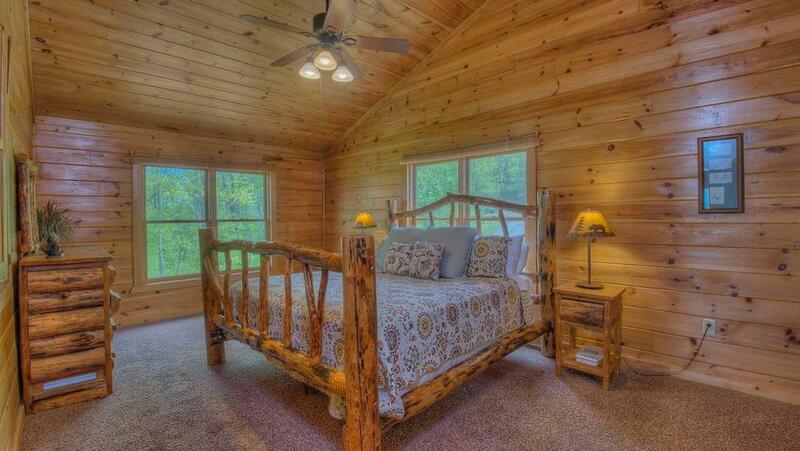 This cabin offers the privacy and convenience of a separate bedroom and full bath on each level. There is a king-sized bedroom in the upstairs master that looks out over the great room. Keep the room's shutters open to keep a check on the kids or close them up for quiet time. The other two bedrooms provide two queens and there is a futon in the game room. 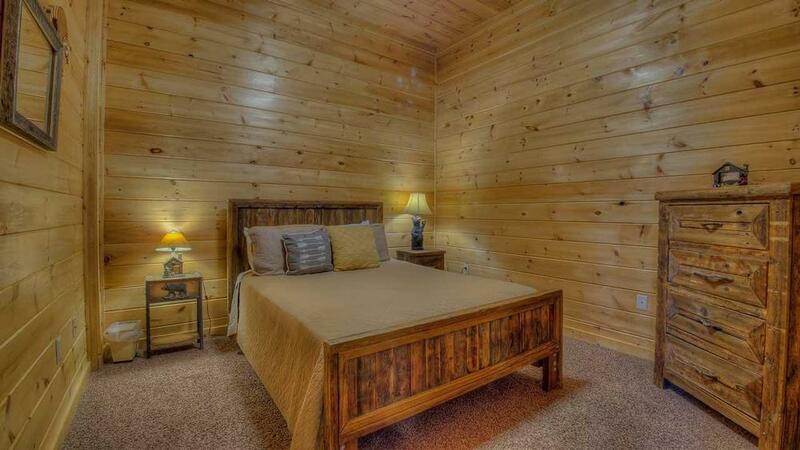 Summit Escape offers great amenities for your perfect mountain vacation experience. Enjoy life at the top where the views will sweep your stress away. 11/18 - The scenic views are amazing. The proximity to the town of Blue Ridge and Mercier Apple Orchards was very convenient, while being secluded enough to feel isolated and relaxing. The staff have very good customer service etiquette. The cabins have been a very good experience overall. 07/18 - The view is great! So nice having a bedroom and bathroom on every floor. Great company! Everything was done as promised. Very friendly. 06/18 - Loved the view. Great company! The cabin was extremely clean. It was spacious enough for our family of 6, and cozy as well. Beautiful views, fairly easy to find. Friendly,polite staff. 3/18 - The view is spectacular and the fact that fire wood is provided is a huge bonus. Easy to find, quality of cookware great. Always great to work with! 2/18 - Beautiful mountain views, relaxing, close to town. Awesome! 10/17- The view was amazing. The staff was always there when I needed them. 08/17- The view is stunning! Spent much time sitting on the deck. 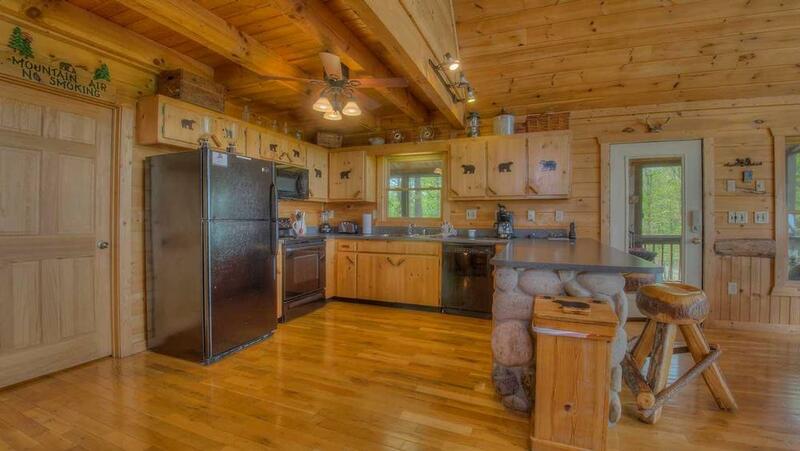 The cabin was very clean and the kitchen well stocked. I wasn't sure that I would have everything I needed in the kitchen so I brought some things from home. Specifically a large pot to boil. No need because there were several very large pots. I was very appreciative of this well stocked kitchen. The beds were comfortable, and the pool table got a lot of use. It was a great weekend. 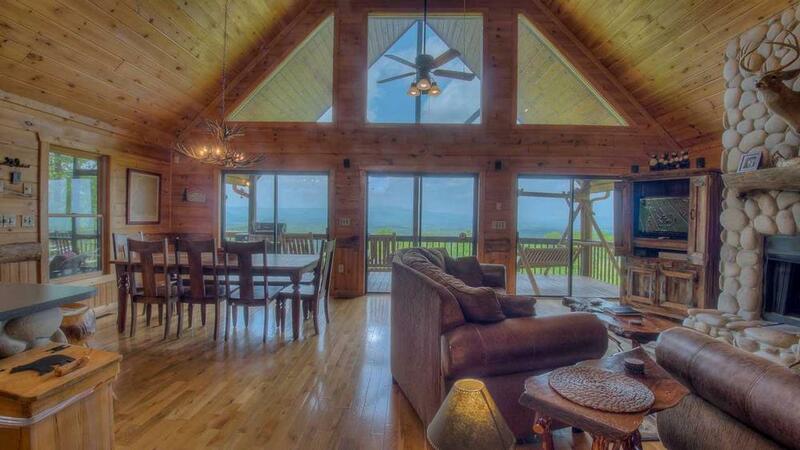 This is the 2nd time we have stayed at an Escape to Blue Ridge property and plan to again. The staff are quick to respond and the process for booking so easy. 07/17- The view was breathtaking, the beds were very comfortable, the house was perfect for our family. Everyone we dealt with from the company was friendly and helpful. 07/17- The view was breathtaking. 07/17- Our favorite feature of the home is that everything we needed for our meals was there and we don't have to bring anything for the kitchen, even a cheese grater! Love Escape to Blue Ridge! Have been twice and will definitely be back! 06/17- The view was awesome!! The layout of the porches and interior worked well. This was our second time using this company and everyone was very kind. 06/17- The view was absolutely amazing and the sunsets every night were breathtaking!!! I loved the entire staff at Escape to Blue Ridge!! Everyone was so friendly and incredibly helpful!! I will definitely use them again for future bookings. 05/17- We really loved this cabin! First off, the view was incredible. Sweeping long-range views of the mountains; very wide/panoramic view with no huge trees blocking the way. Really liked that it had both screened (for bugs at night) and un-screened porches. The basement was great for entertainment. Quick/easy convenience to downtown Blue Ridge was also a plus. Very easy to navigate to it, and roads that don't make you feel like you're off-roading (or need a 4X4). Company was great. Very easy to reach/responsive and polite/professional. Excellent communication before, during, and after the trip. Would definitely use again. 04/17- Our favorite features of the home were 1) View 2) Porch 3) lots of windows 4) open floor plan. 03/17- Our favorit feature of this cabin was the awesome views. This is our 5th stay through EBR. That indicates you're doing something right. 02/17- Loved the view. The staff was great to deal with . 01/17- My family thoroughly enjoyed this cabin. 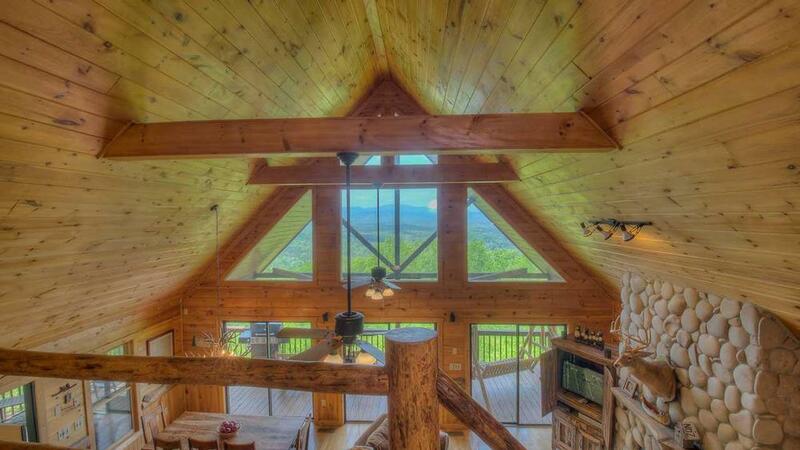 It is spacious with a great view of the mountains. Escape to Blue Ridge was extremely easy to work with in booking our cabin for the weekend. 01/17- The home has an awesome view and we really enjoyed the outdoor fireplace. This is our second time to stay here. Will continue to rent from Escape to Blue Ridge. 12/16- We enjoyed the game room, the fireplaces, the view and the porch swing. 11/16- We loved the view. Excellent customer service! 11/16- The location is awesome. The amenities are great. Very clean and spacious. Excellent company. Very patient and helpful staff who always pick up the phone when you call. It is a delight to talk to the company folks. 11/16- The view is good and the amount of outdoor space is awesome. 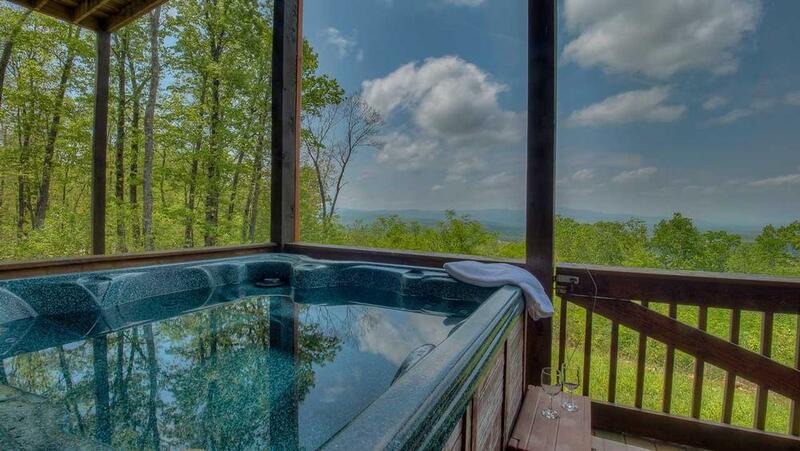 Love that you can enjoy the view while in the hot tub. Nice folks and they do a good job. 10/16- Our favorite features of the home were the many windows with fantastic views. Excellent. company. 10/16- Great view and location. Great company. 10/16- The view far outshines the photographs on the website...outstanding, with very pretty sunsets! The outdoor (but under roof) porch area was the big hit of the property. We probably spent 80% of our non-sleeping hours in that area. The back deck facing the mountain ridge is nothing short of spectacular. I have rented several times from Escape to Blue Ridge. You are my go to when we come to your area. We visit at least once per year, and will continue to use your stellar service in the future. 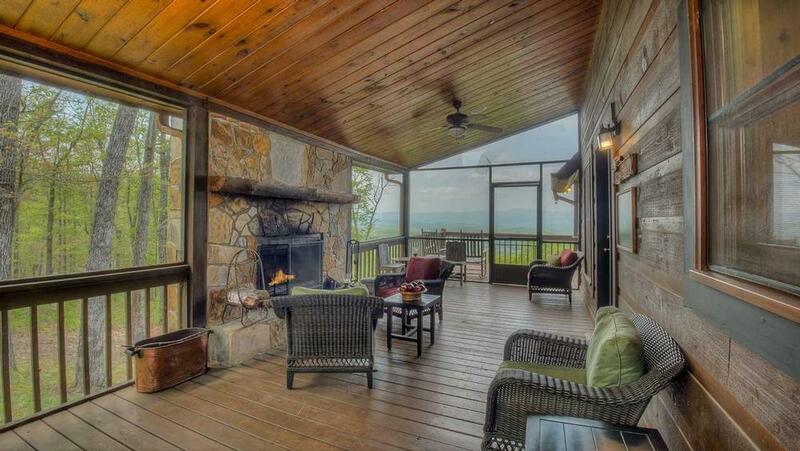 10/16- Our favorite features of the home were the outdoor porch fireplace area & the view. 07/16- The view from the cabin was incredible. 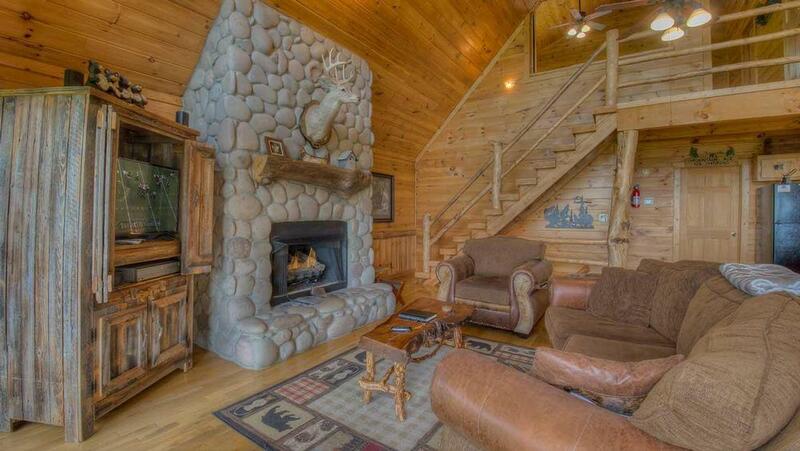 It did provide us with the "Smoky Mountain Cabin experience" that we were looking for. 07/16- Loved the views of the mountains. It was also a quick drive to town for shopping and lunch. The company is very friendly and helpful. 06/16- Mountain views, outside fireplace, swing on porch, all home amenities,pool table, air hockey for kids, washer & Dryer & kitchen. Home was very comfortable except for one bedroom mattress. 05/16- The western view from the porch provided us with an amazing sunset. 04/16- The view was absolutely spectacular. We enjoyed sitting by the living room fire place. We were quite satisfied overall with Escape to Blue Ridge. The booking process was easy, and the website is quite user friendly. I'm also very grateful to Felicia, who personally drove down to the gas station to deliver my pink bathrobe that I had left behind :) Thanks so much for a lovely vacation! 03/16- The view was breathtaking!! 02/16- The screened in porch with the fireplace was awesome. The kitchen was as well equiped as any place we have ever rented. Of course the hot tub, game room, and most important the view were fantastic. One of the best we have rented and we have been coming to Blue Ridge for over twenty years. The only improvement to us personally would be if it was pet friendly!!!! 02/16- Beautifully decorated--has a very "cabiney" feel to it which is what we were looking for. 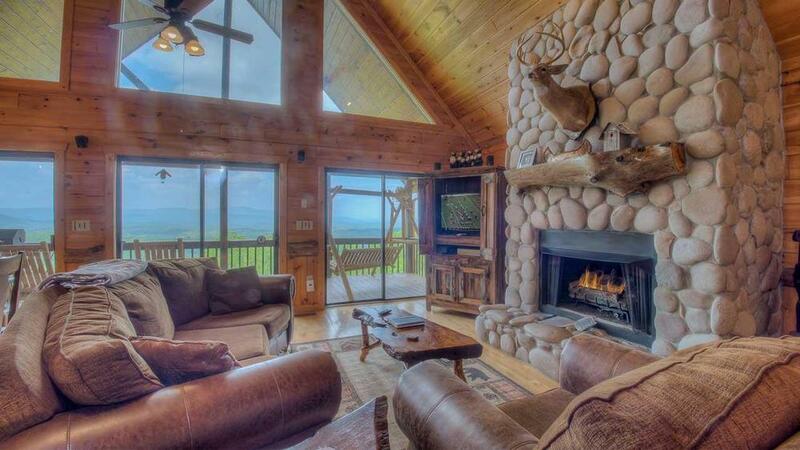 Amazing views of the mountains, loved the outdoor fireplace. We arrived after dark but locating the cabin was pretty easy. Very professional--easy to make the reservations. Loved the fact that there was no office to check into or out of---that we could go straight to cabin to start our vacation. We will definitely be back sometime in the spring!! 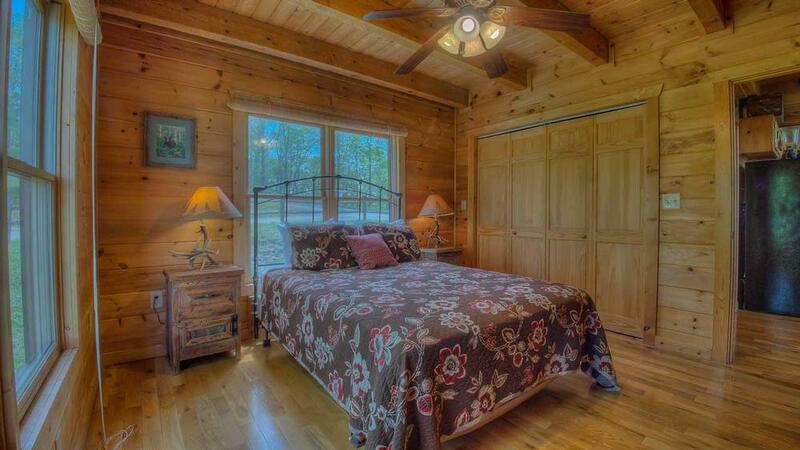 12/15- Excellent view with fireplace on porch, spacious, nice furniture, comfortable beds. Staff very nice and helpful!!! Our stay was wonderful! 11/15- The view was beautiful. The pool table and air hockey table were fun amenities. 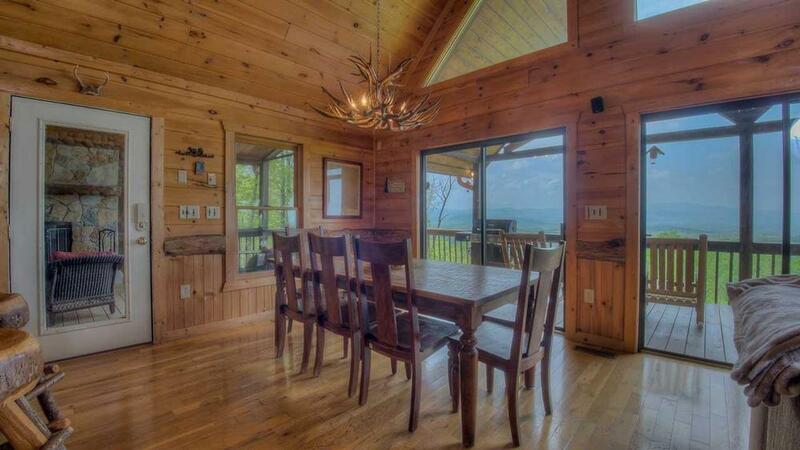 11/15- The view from this cabin is breath taking. 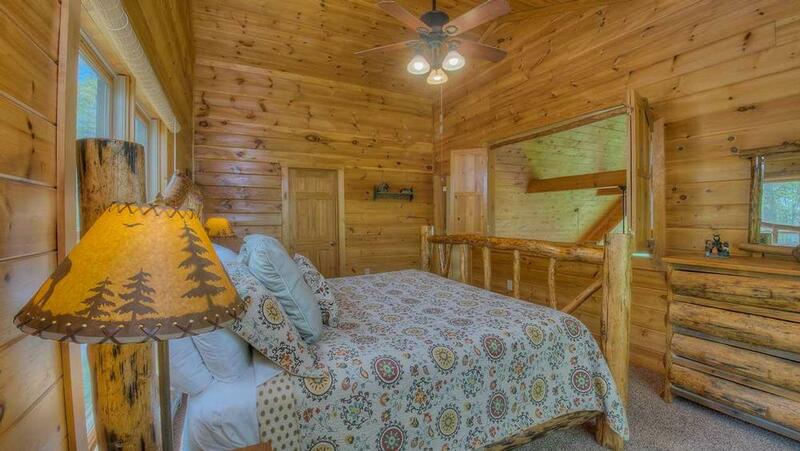 The interior of this cabin is warm & inviting and beautifully decorated. 10/15- Location and layout are perfect. Love you guys and I am already planning next year! 08/15- The view is the best! Your company is top notch. Loved the following up on every detail. 07/15- The layout of the home was perfect for our family. Basically, each couple had their own floor for their bedroom. My husband and I both have issues with steps, so we choice the bedroom on the main floor for accessibility. The deck was awesome to just sit and enjoy the breeze and to see the amazing sunsets. The screened porch was a hit with the grandchildren, a fireplace (pit)for roasting s'mores without all the bugs. The overall experience was wonderful. 07/15- It had spectacular views and plenty of space to spread out. 05/15- It had a wonderful view & it was nice that I didn't have to bring a lot of stuff from home.The company delivered exactly the vacation home I expected & then some. 03/15- Location/view, layout of the house, hot tub and decks were awesome..This was an amazing cabin, location was close to town which made it convenient to go out. Everything was in good condition. We had an amazing, relaxing time! 01/15- The view was breathtaking! The outdoor fireplace and the hot tub were exactly what we were looking for. The large table was perfect for dining together and playing games. This was a perfect place for a girls retreat. 12/14- Great view and location close to town! 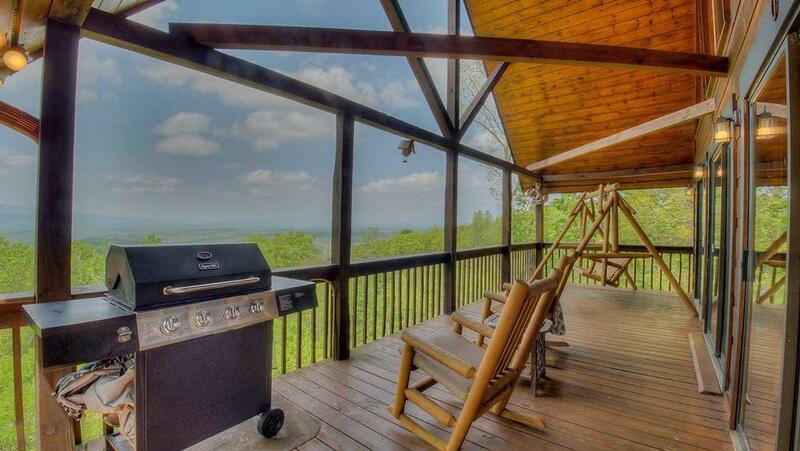 10/14- The view, grill, hot tub, pool table, fireplace. Great house, great time! Well taken care of, clean. 08/14- The view! Absolutely gorgeous. Cabin was wonderful and the location is splendid! Everything was clean and well taken care of when we arrived. Looking forward to coming here again next year. (Fridge took a while to cool from being cleaned) Customer service was excellent! 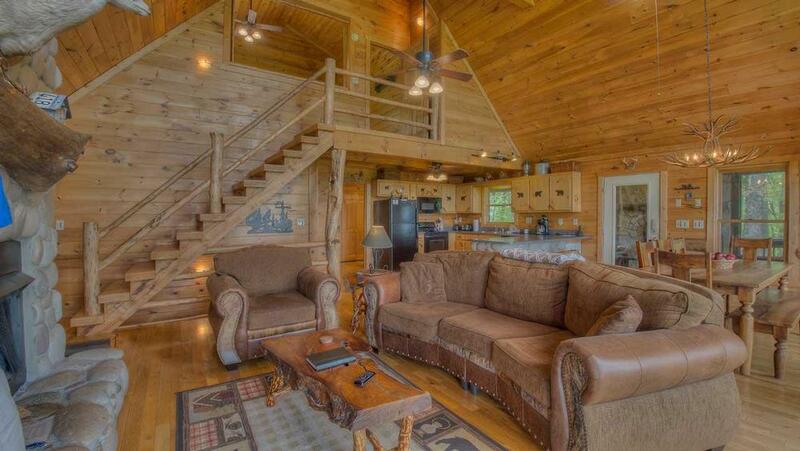 We will definitely look to Escape to Blue Ridge for our cabin next summer! We loved our cabin, Sumit Escape, except for a few minor details. The fact that the cabin faces West and is all glass means that the sun shines directly in for about 3 hours. There needs to be shades or drapes at least on the main level. Also the step to the hot tub is broken, very dangerous. Most of the light fixtures needed bulbs.